The quills were what we would call dip-pens. A scribe cannot write without a pot of ink, and the miniatures of St. John on Patmos sometimes include the figure of a mischievous devil who creeps up behind a bush with a grappling-hook to spirit away the Saint's ink pot. This is an open-air scene and so the pot is portable, presumably with a screw lid, and it is attached by a cord to an oblong pen case. In the scriptorium ink was held in inkhorns; some scribes are shown holding these horns but usually both hands were occupied with knife and pen. Evangelists depicted in Carolingian Gospel Books often have their ink on a separate stand, like a torchère, beside the desk (a sensible precaution if one is prone to knock the pot over). In late medieval pictures the horns are generally inserted into metal hoops attached into the edge of the right-hand side of the desk, and there are frequently two and sometimes three at once. There are examples where the horns are fitted into a vertical row of holes in the surface of the desk itself and their tips can be seen protruding below the table. There are a fair number of medieval recipes for making ink. There were two completely different types of ink. The first is carbon ink, made of charcoal or lamp-black mixed with a gum. The second is metal-gall ink, usually iron gall, made by mixing a solution of tannic acids with ferrous sulphate (copperas); it too requires added gum, but as a thickener rather than as an adhesive. The blackness is the result of a chemical reaction. Both types of ink were employed in medieval manuscripts. Carbon ink was used in the ancient and eastern worlds and occurs in all medieval recipes until the twelfth century. There were certainly iron-gall inks in use by the third century, but there is no literary tradition of explaining them until Theophilus in the earlier twelfth century. Thereafter craftsmen's recipes describe gall inks, and probably almost all later medieval manuscripts are written with iron gall. The recipe is interesting, and it may come as a surprise to learn that a principal ingredient is the oak apple, the curious ball-like tumour, about the size of a small marble, which grows mainly on the leaves and twigs of oak trees. It is formed when a gall wasp lays its egg in the growing bud of the tree, and a soft pale-green apple-like sphere begins to form around the larva. One can find gallnuts quite easily on shrub oaks, even today, though the finest specimens were said to be those imported from Aleppo in the Levant. If picked too young, gallnuts shrivel up like rotten fruit; but when the larva inside is fully developed into an insect, it bores a hole out of its vegetable cocoon and it flies away and the hard nut which remains is rich in tannic and gallic acids. These are roughly crushed up and infused for some days in rainwater in the sun or by the fire. Sometimes white wine or vinegar was used instead of rainwater. This, then, is the first ingredient of iron-gall ink. The second is ferrous sulphate, known also as copperas, green vitriol, or salmortis. It was manufactured or found naturally in Spain by the evaporation of water from ferrous earths. By the late sixteenth century, copperas was probably made by pouring sulphuric acid over old nails, then filtering the liquid, and mixing the filtrate with alcohol (this may explain the acidity of post-medieval inks). The copperas is then added to the oak-gall potion and stirred in with a fig stick. The resulting solution slowly turns from pale brown into black ink. Some ground-up gum arabic is added, not so much to supply adhesive but to make the ink thicker. Quill pens need the viscosity of gum; fountain pens, in fact, do not. Gum arabic is the dried-up sap of the acacia tree, brought to Europe from Egypt and Asia Minor. Iron-gall ink darkens even further when exposed to air on the pages of a manuscript. It soaks well into parchment, unlike carbon inks which can be rubbed off relatively easily. It is more translucent and shinier than carbon ink which is grittier and blacker. 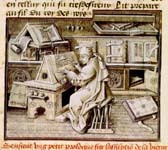 Medieval pictures of scribes sometimes show two inkhorns on the right of the desk. The second container was probably for red ink. Red was used greatly in medieval manuscripts, for headings, running titles and initials, for rubrics (hence the word) in liturgical manuscripts, and for red-letter days (hence that term too) in Calendars. Corrections to the text were sometimes made in red, drawing attention to the care with which a text had been checked. Blue and green inks exist, but are rarer; red was always the second colour. Red ink in manuscripts goes back at least to the fifth century and flourished until the fifteenth. It must have been the spread of printed books, in which producing coloured text is very complicated, which eroded the doubtless standard medieval assumption that books were black and red. Printed books are just black, which is duller. Vermilion is mercuric sulphide, and is turned into red ink by grinding up and mixing it with white of egg and gum arabic. Red ink can also be made from brazilwood chips which were infused in vinegar and mixed with gum arabic. Brazilwood, one should explain, is not a native of South America - the country was named after its abundance of the well-known trees already familiar to makers of medieval red ink. Both the exemplar and the copy were usually ' simply placed side-by-side on a sloping desk. We can see in miniatures that manuscripts were held open by weights hanging from each end of a string, with one end dangling over the back of the desk and the other hanging down across the top of the page. A parchment manuscript will tend to close itself unless it is held open. Sometimes the weights are shown as more-or less triangular with rounded tops and extended horizontal lower edges. As the scribe copied a text, it would be relatively easy to pull the weight down the page so that the long horizontal edge of the weight would very effectively mark his exact place in the exemplar. Scribes sat very upright, often on tall backed chairs (to judge from pictures again), before a sloping desk. Some medieval illustrations show the desk top actually attached to the chair, apparently hinging up to let the scribe sit down and then falling down again into place, rather like a baby's highchair. Looking at the pictures, however, it is difficult to envisage how the scribe wriggled into the seat; even with the hinge up. The slope is quite steep. Quill pens are most effective when held at right angles to the writing surface, and this is easier to achieve on a slope. It is tiring for an unpractised modern writer to work on a steep slope because the way we hold our pens requires the resting of the edge of the hand on the page and manipulating the fingers. But a pen held as described earlier scarcely requires the hand to touch the page at all and the movement is from the arm. For this, the flexibility of a sloping desk is ideal. As ink takes some moments to dry, one can sometimes see on the pages of medieval manuscripts that the concentration of ink is in the lower edges of the letters as it has settled down the slope of the desk. As the scribe sat down to commence copying, he was recommended by the recipes to give his parchment a final rub over with fine pumice and to smooth the surface off with chalk. This is to remove any grease stains that may have come about in handling and folding the sheets, and to reduce the risk of the ink running. As he actually wrote, the scribe held a knife in his left hand. This is important, and universal in the Middle Ages. Writing, like eating, was a two-handed operation. It meant, among other things, that he had no spare hand for following his place in the exemplar. The knife was for sharpening the pen and for erasing mistakes (quickly, before the ink had really soaked in) and, more practically, for holding down the always springy surface of the vellum, moving along the line as the scribe wrote each word. To steady the page with the finger is potentially greasy and clumsy, but a knife tip gives precision and control.